The University of Bonn (German: Rheinische Friedrich-Wilhelms-Universität Bonn) is a public research university located in Bonn, Germany. 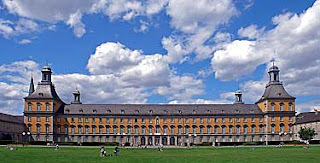 Founded in its present form in 1818, as the linear successor of earlier academic institutions, the University of Bonn is today one of the leading universities in Germany. The University of Bonn offers a large number of undergraduate and graduate programs in a range of subjects. Its library holds more than two million volumes. 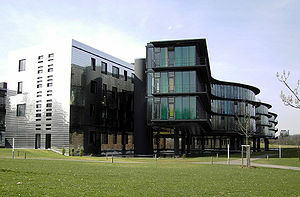 The University of Bonn has 525 professors and 27,800 students. Among its notable alumni and faculty are seven Nobel Laureates, two Fields Medalists, twelve Gottfried Wilhelm Leibniz Prize winners, Pope Benedict XVI, Heinrich Heine, Friedrich Nietzsche and Joseph Schumpeter. The Rhineland became a part of Prussia in 1815 as a result of the Congress of Vienna. Shortly after the seizure of the Rhineland, on April 5, 1815, the Prussian king Friedrich Wilhelm III promised the establishment of a new university in the new Rhine province (German: den aus Landesväterlicher Fürsorge für ihr Bestes gefaßten Entschluß, in Unsern Rheinlanden eine Universität zu errichten). At this time there was no university in the Rhineland, as all three universities that existed until the end of the 18th century were closed as a result of the French occupation. The Kurkölnische Akademie Bonn was one of these three universities. The other two were the Roman Catholic University of Cologne and the Protestant University of Duisburg. The new Rhein University (German: Rhein-Universität) was then founded on October 18, 1818, by the Prussian king Frederick William III. It was the sixth Prussian University, founded after the universities in Greifswald, Berlin, Königsberg, Halle and Breslau. The new university was equally shared between the two Christian denominations. This was one of the reasons why Bonn, with its tradition of a nonsectarian university, was chosen over Cologne and Duisburg. Apart from a school of Roman Catholic theology and a school of Protestant theology, the university had schools for medicine, law and philosophy. Inititally 35 professors and eight adjunct professors were teaching in Bonn. During the second World War the university suffered heavy damage. An air raid on October 18, 1944 destroyed the main building. The university was re-opened on November 17, 1945 as one of the first in the British occupation zone. The first university president was Heinrich Matthias Konen, who was expelled from the university in 1934 because of his opposition to Nazism. At the start of the first semester on November 17, 1945 the university had more than 10,000 applicants for only 2,500 places.